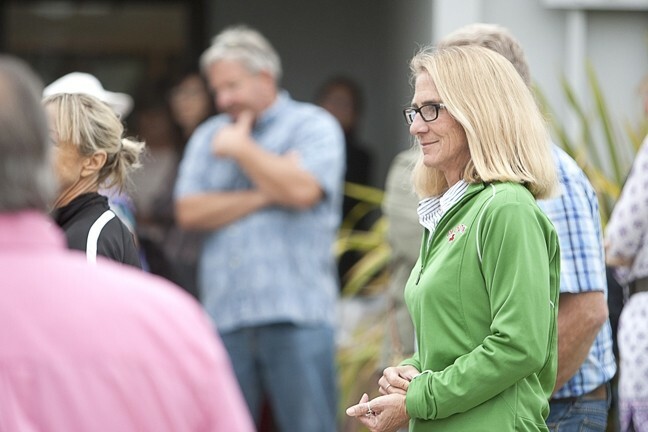 A LESS-THAN-FOND FAREWELL: Long-time Morro Bay City Manager Andrea Lueker (right), pictured here during the first in a series of contentious closed session meetings on her employment, finalized a separation agreement with the city on Dec. 12. It began as what sounded to many locals as a sudden and unexpected announcement: There would be a major changing of the guard in the Morro Bay city administration. It ended up lasting three antagonistic months. In November, City Attorney Rob Schultz was given the boot by a slim city council majority. On Dec. 12, City Manager Andrea Lueker accepted a separation agreement with the city she’s served for more than 27 years. She was placed on administrative leave Dec. 13, and her final separation date will be Jan. 3. According to the agreement, Lueker will receive $116,469—the equivalent of nine months’ pay—as well as about $37,333 in remaining vacation, sick leave, and holiday pay. The agreement states that she may not accept—nor may the city offer—employment with Morro Bay for three years, and that any disputes between the city and her are officially resolved. “I am proud to have been a public servant for the City of Morro Bay and believe that public service is about putting others first and trying to make the world a better place, usually one person and one need at a time. I believe we have done just that in Morro Bay,” Lueker wrote in a statement to the public. She added that she was proud of accomplishments made during her tenure, such as providing new parks and open space and enhancing city infrastructure, facilities, and programs. She has not stated publicly what she plans to do following her separation. Schultz has since taken a job as counsel for the town of Los Gatos in the Bay Area. The City Council, however, has begun the process of filling Lueker’s former position. Citing rules regarding personnel confidentiality, the city has never stated why the action was taken against the two long-time—and according to many residents, very popular—public servants.